Koei Tecmo have announced that the Gust-developed magical girl RPG Blue Reflection is heading westward both physically and digitally for PS4 and digitally for PC via Steam on 26th September in North America and on 29th September in Europe. The PS Vita version is not listed, suggesting it is not coming. There are also store-exclusive preorder bonuses for both brick and mortar stores to both the PSN and Steam digitsl storefronts. Burlingame, Calif. – June 6, 2017 – KOEI TECMO America is excited to confirm today the upcoming release of Blue Reflection, developer GUST Studios’ latest original project set in an all-girls high-school in modern day Japan. Headed to the PlayStation®4 computer entertainment system and digitally to Windows PC via Steam® on September 26, 2017, today’s announcement reveals information on the upcoming RPG’s heartwarming narrative, colorful main characters and pre-order bonuses alongside a first batch of assets. 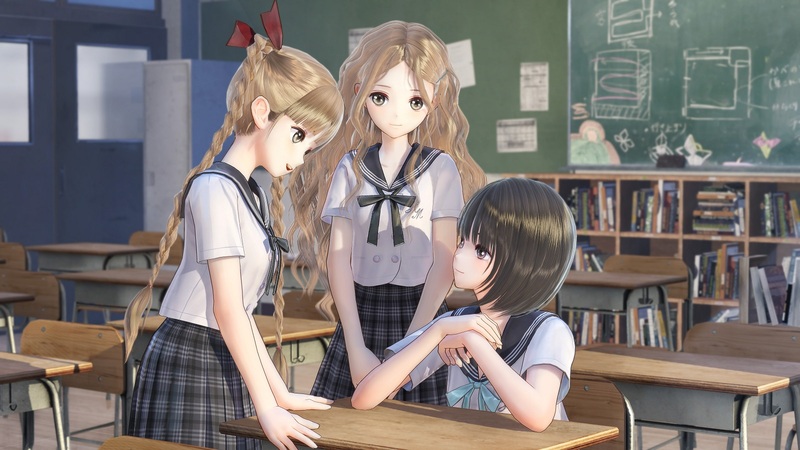 A selection of images showcase school life in Blue Reflection and provide a first look at the game’s main character, Hinako Shirai, her closest friends, Yuzuki and Lime Shijou, Shihori Sugamoto, the innocent fashionista who treats everyone as equals, and the troublesome but kind-hearted Chihiro Inoue. The twin sisters bestow Hinako with the power of a Reflector, a champion who can manipulate a mysterious parallel dimension known as The Common. Hinako can freely move and shape this mystical realm’s beauty with her imagination, but she soon understands the very real perils that await her and her friends. As Hinako learns to treasure her companions and creates new bonds with those around her, she gains new strength to help her fight in The Common. A selection of digital bonuses is available to prospective players who pre-order Blue Reflection from Amazon, Best Buy, EB Games and GameStop. These include the School Swimsuit and Rorona style costumes – the latter being the outfit of Rorolina Frixell from Atelier Rorona – and a “FreeSpace!” theme to change the look of their social networking app, a key in-game feature used to stay in touch with companions outside of school. Those purchasing the game on the PlayStation®4 system will also receive an exclusive Original Custom Theme. More information on the game’s narrative, compelling characters and key mechanics will be revealed in the coming months. To stay up-to-date on news regarding Blue Reflection, Like KOEI TECMO America on Facebook at www.facebook.com/koeitecmous, and become part of the #KTfamily by following KOEI TECMO America on Twitter at @KoeiTecmoUS. This title has been rated “T for Teen” by the ESRB.